1). Peel and roughly chop the carrots. Blend the carrots along with green chillies and little water to a coarse paste. Strain the juice using a strainer and keep it aside. 2). In a mixing bowl, mix wheat flour, sooji, salt and cumin powder. Then add the carrot paste and knead. Sprinkle milk or water and make a smooth dough. Add a tsp of oil at the end, cover and allow it to rest for 30 minutes. 3). Knead the dough once again and make equal shaped balls. Roll the balls into medium thick poori's. 4). Heat oil in a pan, once it is hot slowly slide the rolled poori's. Press the poori's with the laddle as it helps to puff up. Flip the poori and cook on the other side too. Once it becomes golden brown, remove it from oil and strain it on a paper towel. 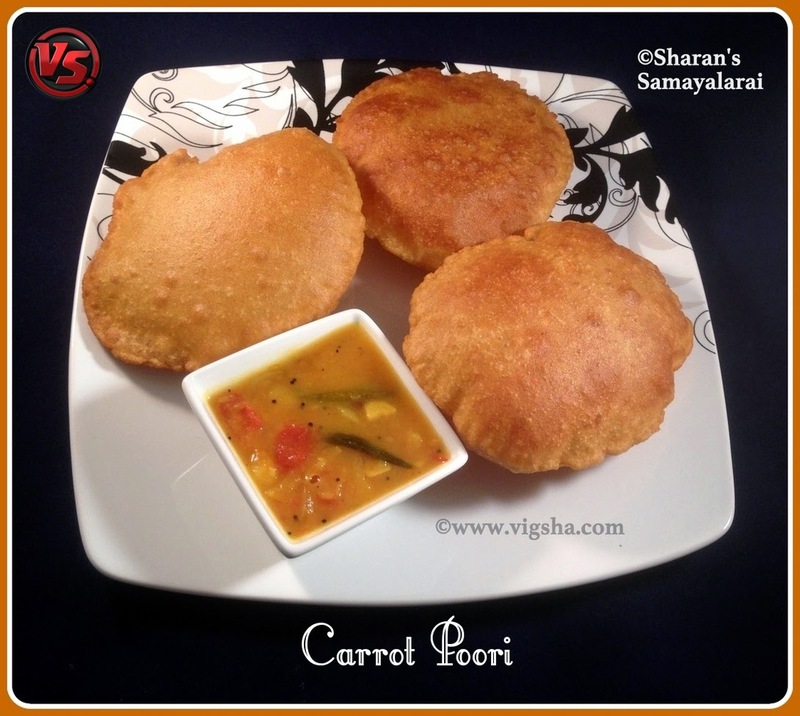 Enjoy the delectable poori with Potato Masala. Serve hot ! # Use milk for the dough if you want soft poori's. You can also use water instead of milk.